If I read the bottle coding right, this was bottled in August 2017. The label states Portsmouth, NH as one of the brewing locations. That facility was later closed and re-branded by Craft Brewers Alliance, owner of Redhook, as Cisco Brewery, a New England brewery also in the CBA stable. I knew all this when I bought it, but bought it anyway. The label stated dry-hopping – an addition of unboiled hops to the finished brew to enhance hop character – plus generous use of hops in the brewing. This encouraged me to think the hop charge would preserve the beer over 18 months, irrespective of any pasteurisation that may have been applied. 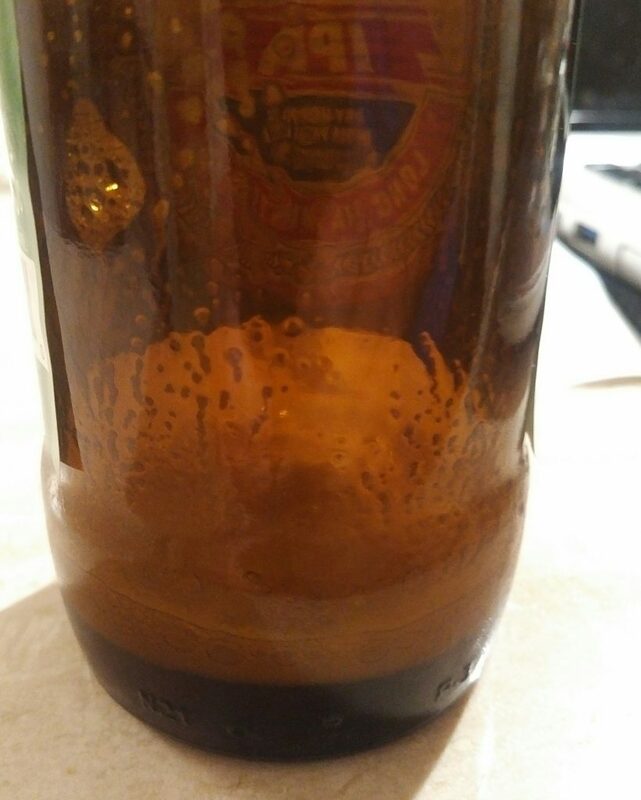 And it sure did: the beer showed not a hint of damp paper oxidation or other age affliction. The hops were well-integrated in the taste and the beer had a good malty body to “absorb” them. After all, India Pale Ale was meant to be long stored and shipped, originally. Only recently did the idea grow, for reasons valid unto themselves, that IPA needs to be drunk as fresh as possible. That is true of beers given a large dose of aroma hopping where that burst of flowery fruity freshness is wanted in the palate. The original IPA was different: the idea was to preserve the beer from souring and if hop bitterness or other attributes diminished in the process, that was okay and even proof the hops did their job. 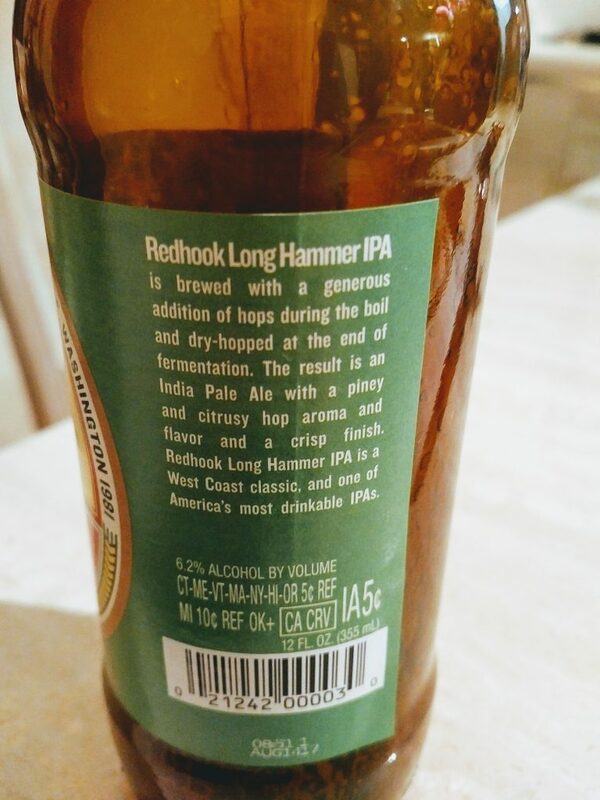 Redhook IPA, a beer with an impressive craft lineage – it has its genesis in Ballard Bitter, an early product of the pioneer brewery (founded 1981) – is perfect for such treatment. This is not to say it is not excellent when very fresh; I’m sure it is. The hop accent here is the craft workhorse Cascade, perhaps 100% Cascade, as many early craft ales were. I’d think Jack McAuliffe’s historic New Albion Ale (1976-1984) tasted similar to this beer. It has a citric taste but without the 100 watt intensity many later IPAs featured. The taste is a bit earthy too and, well, “down home”, but this was the taste of early American craft ales on the West Coast as I well recall. 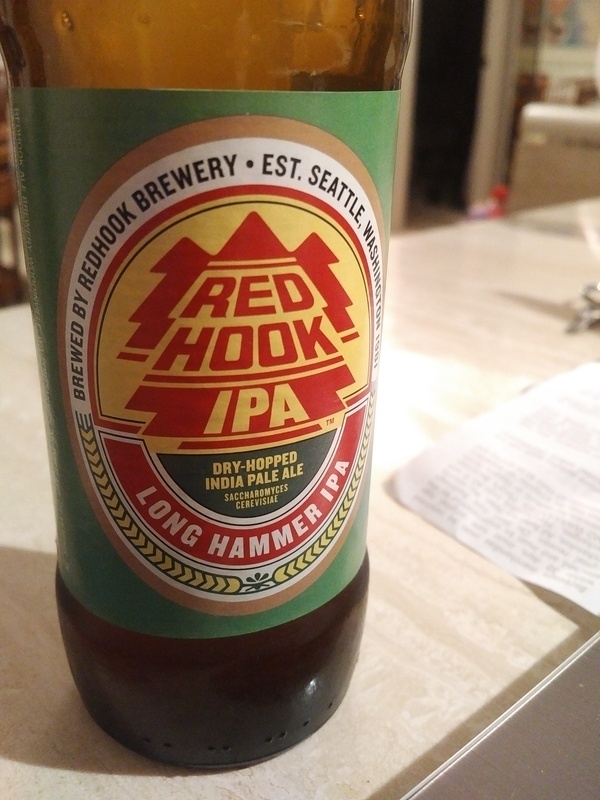 Redhook’s IPA is still popular in Seattle, home turf of the brewery, and long may it reign there. I mentioned this blend in a tweet and it turns out to be perhaps the best I’ve ever done, it’s half each of the beers shown below. The result is like a really good Munich Dunkel, or dark lager. The American (Florida) Kölsch is certainly very nice on its own, as is the Spaten double bock, but the combination creates synergies that surprised me. True, the Kölsch is top-fermented (by nature), the other is a lager, hence bottom-fermented, but with both reflecting a German approach in mashing and hopping, it all meshes really well. If need be I’ll rely on the current fashion in brewing to use mixed fermentations, but that only goes to show if the final result is good, go with it. 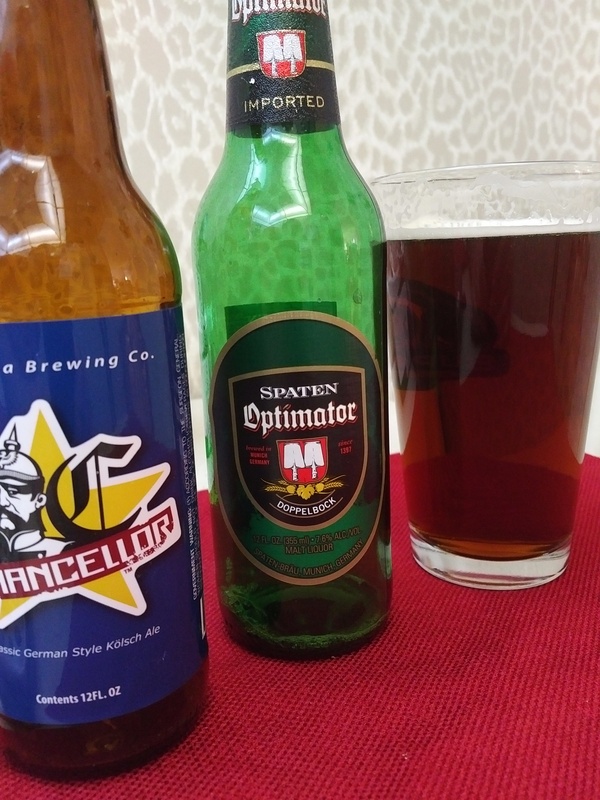 I did the blend because I had two bottle ends to use up and also, the Spaten is around 8% abv and I wanted to bring the strength down. I had a feeling though the result had to be good given the components, and it was, in spades. I stopped by the Funky Buddah brewpub and brewery for beer and lunch, in Oakland Park, Fort Lauderdale. It’s built in a stylish, prewar factory or warehouse with a spacious area for the long bar and seating. The brewing kit and fermenters are tucked in the back. The building is painted in a buff yellow that enhances the mid-20th century feel. You see similar warm structures on the West Coast. The beer styles offered, a wide range, are contemporary to the max, with flavoured beers leading the charge but choices available for traditionalists such as myself who generally eschew the flavoured, sour, and wild. The best beer, or one I liked best rather, was Gloves Off IPA, a red IPA hopped with Amarillo, an orangey hop I favour in pale ale styles, and feisty Mosaic. These give an American stamp without the strong grapefruit taste that can be coarse unless in the hands of Allstate. A dark ale hopped with English varieties was less successful with a biscuity edge familiar to anyone who knows craft brewing in the last 30 years, i.e., not really trad English. Hop Gun (I had a flight) is an in-your-face west coast IPA, as the name implies. An oats-infused pale New England IPA was good too, drier and perhaps influenced by the brut style. A Marzen beer was letter-perfect Vienna-style, malty and the true, inimitable Mittel Europa. It’s in my genes, trust me. No stout unflavoured was available, a real pity as flavouring the stuff traduces the character. A bourbon barrel Imperial Stout was very good for the style and nice to have as an option, but a regular Imperial stout, one of the great beers of the world, would have been appreciated. Good pub food, burgers, pulled pork, tacos, wings, etc. completed the picture. 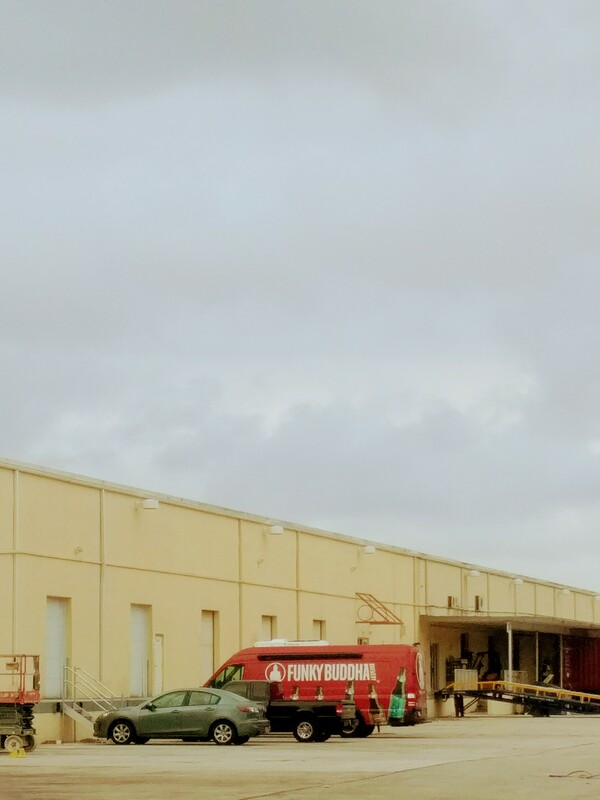 State of the art brewing for the most part, and good atmosphere with even a functioning rail line next door to rattle and roll ya when the beer lulls to complacency. In the end, the Buddah is all-American, down to noting when I was paying that my bank card is “international”. Yes and no. Before craft beer and craft anything, before pumpkin latte and iron chefs, there was (of course) an appreciation of fine beer, food, wine. It took different forms, generally more elitist, more exclusive, at least as mediated through the general culture. The preoccuption characterises the West back to ancient Rome and Asian and most other cultures too. In these earlier times a lover of food was often “epicurean”, a word that sounds suspiciously old-fashioned now, or suspiciously anti-democratic. He or she might be an essayist, poet, traveller, ethnologist. The world was simpler then (tell me about it). There was no hospitality industry to speak of, no field of food science, no university departments of food history, no or few newspaper columnists who specialised in food and wine, never mind beer. But there were serious students of the palate, and people have always written books or essays on food that studied its esthetics, social context, and history. It is idle to recite the names, google Gastronomy and that will clue you in. I’ve written about mid-20th century gastronomic societies as well as some 19th century proto-beer critics as examples of this distant past. This old school elucidated or entertained into the 1970s when suddently appreciation of food and drink took on a democratic spirit. This coincides with the growth of the consumer society, itself an outgrowth of liberalisation of economies and triumph of industrial capitalism in the West and elsewhere. Overlooked cuisines, Jewish food, say, or soul food, or regional Chinese cooking, came in for close scrutiny and became the stuff of commissioning editors (talk about old-fashioned!). And so we’ve ended, or so far, with cooking and travel shows, national cooking competitions, the Gordon Ramsays, the Jay Rayners, the Rachel Rays. The tone varies now from braying to babying, but the preoccupation is same as it ever was: good things to eat, where they come from, how to find or prepare them. In the older period, before pocket guides much less online information available at a keystroke, the idea was prevalent that when travelling, you should drink the “wine of the country”. Of course the idea persists, and has even grown. Ideas such as terroir, “drink local”, and ethnic food exploration all give expression to the same notion. In other words even in a more elitist time, when gastronomic societies abounded, when writing seriously about food required a private fortune (e.g. as Julia Child had) or a day job of some kind, the idea existed that wine, and by implication other comestibles, had value simply by being local, hence authentic. Even if one didn’t have the money to order a classified growth in a grand hotel, one could sup the local vintage, perhaps in company or view of those who made it or their kin. It might be a Cahors, a Rioja, a minor Friulian wine. It might be Bohemian Pilsener, or a British “bitter”. You drank what you found on the ground, almost literally. Where did this idea of wine of the country originate? It goes back at least to the 1800s, as citations in the sense understood today – today meaning here, c.1975 – go back to 1900. Ernest Gilbey, the English wine merchant whose name famously adorns a brand of gin, used the term in Parliamentary testimony on additives in wines. He stated some Portuguese “red wines of the country” were never exported, due at the time to the difficulty to preserve them (a clue to why things changed later). The term wine of the country became part of the cultural acquis by WW II, a chattering class staple. The American novelist Hamilton Basso, Louisiana-born but based in New York most of his career, used the term to title his 1941 novel of southern Gothic, Wine of the Country. Here, the words were a metaphor for a regional ethos he contrasted negatively with the cultured if emotionally less fevered northeast. With the spread of a worldwide foodie culture as well as a sophisticated food and beverage science, the idea of the local is today qualified. It still exists of course, but is influenced much more so by developments in other places than ever before. Hence ironically if you ask for IPA in London, you will get the American type that was developed from about 1980, not the English original that inspired it. If you ask for a glass of red wine in Europe, you might get something tasting rather of California – in that style – than anything from a Continental canton. Mondo vino, it’s been called. Still, local still means something, it does exist, sometimes with a little searching. 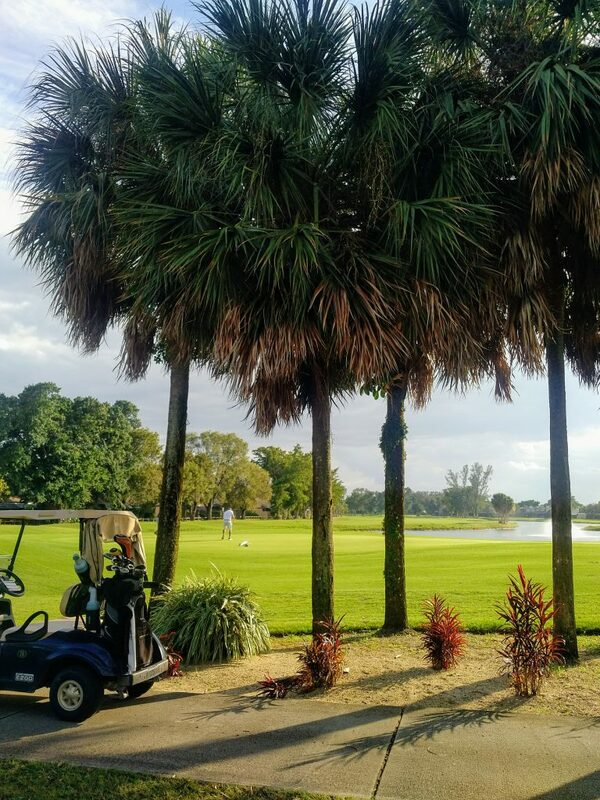 What is the wine of the country in Florida? It is unquestionably mass-market, adjunct beer. 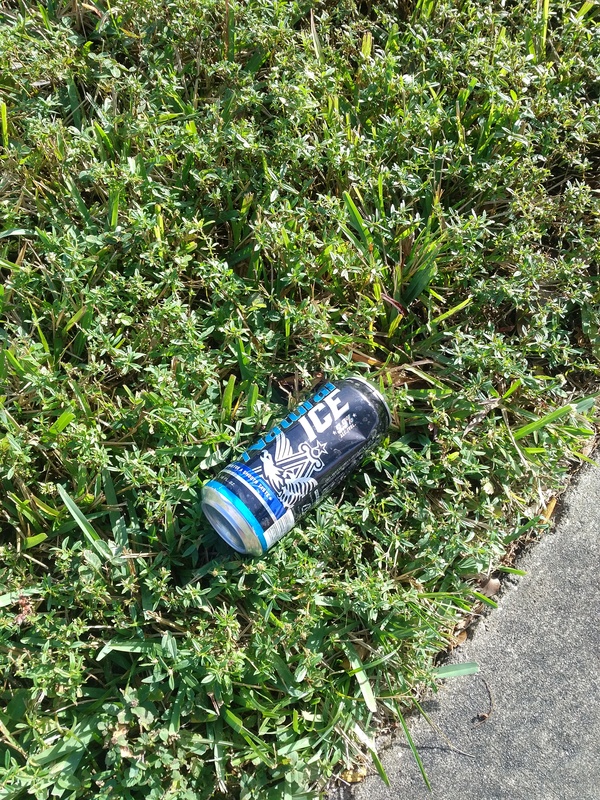 Walking miles through suburbs and seaside towns these last weeks, the litter on lawn and waterways confirms it: Natural Light (or Ice); Busch; Modelo; Bud Light; Corona. I never saw a craft beer container discarded that way. The highest order of beer treated that way was Heineken – just the carton wrapper, actually. The crushed cans – well, crushable you know – attested all to the regional taste. The beer might be made in Florida (the Buds and Busch, say), it might be made in Central America somewhere, but it all offered light taste, relatively low alcohol content, and generally low price. The ranks of those beers in the supermarkets, the beer lists in the restaurants, simply confirm this. Of course, there is a vibrant craft brewing culture here, and some 300 breweries in fact that churn out craft beer as good as anywhere. But it’s still decidedly a minority taste, I’d estimate not more than 10% of state sales, 15% maximum. The “wine of the country” in Florida is one of the beers mentioned, or another of that type, Presidente, Victoria, Dos Equis, Miller Lite, Old Milwaukee, the list goes on. And so in line with the old injunction, I am drinking the wine of the country. The implication of old was, the local stuff might be good, but if bad or indifferent drink it anyway because it is genuine, the people’s choice. I’ve tried as well numerous craft beers, but also this wine of the country, to see what the old learning could teach me. Well, not that much really. The mass market adjunct beer seems less palatable than ever. I’ve tried Budweiser, Corona Familiar, Presidente, Foster’s Ale (brewed in Texas), and from a beer specialist point of view, it’s all rather uninspiring. The craft sector, as well as certain quality imports, are where the action is for the student of beer, but these are not the wine of the country. Not yet. As bruited in press reports a few months ago, the Brewers Association (BA) has changed its definition of craft beer again, reports Beverage Daily. Essentially the requirement to have a majority of production in beer made from traditional or innovative ingredients is discarded, such that anyone with a federal license who makes beer as such qualifies, provided beer production does not exceed 6,000,000 bbl and a non-craft brewer, basically a large industrial brewer, does not own more than 25% of a craft brewer. This means a brewer can make more cider than beer, or other non-beer alcohol beverages (e.g., malternatives so-called) and still qualify for membership in the BA. This is an entirely logical change. 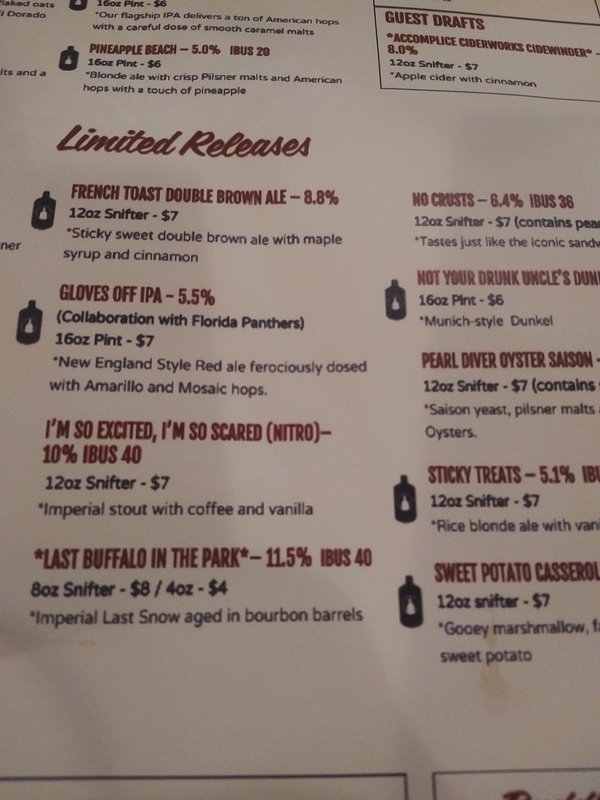 Cider, or sake, or a coffee-alcohol infusion, should not disqualify from membership when many craft brewers now make one of these drinks or have an interest to do so. A deep interest in beer characteristics and history, honed over the last 40 years under influence of craft brewing, has shown to many connections with other alcohol beverages, either due to sharing the fermentation step or a similarity in alcohol levels or the occasions when these drinks are consumed. Not least too, large brewers now make craft beer in the sense traditionally understood: full flavour, often all-malt and well-hopped, unpasteurised. This is due again to the successes of the beer revival assiduously promoted by small brewers and beer writers for those 40 years. Hence, small brewers no longer have a monopoly on quality beer. A brewer of any size can make quality beer, as of course existed in some cases (if not the norm in the U.S.) before craft beer started. That being so, craft beer definitions based on product formulation, or percentage of company sales represented by beer, just don’t make sense. Today, the real and only dividing line between brewers is scale of production: small vs. large, national vs. regional or local, with of course some shading of those categories by larger independents. Whether Boston Beer Company prompted the change, as some have speculated, is irrelevent if the change makes sense on its own terms. (Not that excluding BBC, aka Sam Adams, would make any sense given its historic importance to craft brewing and the large amount of beer it still brews). Really, the industry lobbying situation is now where it was before craft beer started. There were two national lobbies. One that still exists which represented the large national breweries, and a second representing smaller regional or local brewers. Specifically, you had what is now the Beer Institute, incorporated in 1862 as the United States Brewers’ Association, Inc., which represented and still does the largest brewers, the makers of Bud, Miller, Coors, and so on. And there was also the Brewers Association of America, which grouped the smaller, regional breweries. That structure recognized the economic reality that size often dictates very different interests. There will always be some overlap, but size and scale have always, in most industries, been key determinants for producers’ interests. A small brewer, to take an obvious example, is interested to preserve and enhance favourable excise treatment. It will be more interested in keeping up on latest industry technology, and training. An industry association can help with that. The mega-brewers can handle the regulatory and technology issues themselves. When craft beer emerged, a third group, the Association of Brewers, was formed to advance its interests. At the time this made sense as there was a clear demarcation between the beer made by its members and beer from the other two groups. It was not just a scale difference, it was a total difference of brewing philosophy, one that has now disappeared due to the successes of the craft beer movement. 1983 – The Association of Brewers is organized to include the American Homebrewers Association and the Institute for Brewing and Fermentation Studies to assist the emerging microbrewery movement in US. 2005 – The Association of Brewers and the Brewers’ Association of America merge to form the Brewers Association. So, by 2005 the Brewers Association of America, due to changes in national beer preferences inaugurated in good part by the Association of Brewers (Charlie Papazian, etc. ), saw its separate existence had no further utility. Today, with the most recent changes to the craft beer definition, the national lobbies have re-assumed their pre-1980s structure. There are two main groups, the BA and the Beer Institute, with the main differentiation being scale of production. It is the one one and only factor that remains to distinguish validly the interests of the members. While the 6,000,000 bbl threshold is somewhat arbitrary, still the reality is that the average member of BA has interests that diverge considerably from the average member of Beer Institute. As the BA’s site spells out, in practice the characteristics of beer made by BA members will often be distinctive, but the line is not as clear-cut in the past – not when national brewers own a passel of craft brewers or make in-house beers functionally similar to craft beer. Hence, how much cider a BA member makes, or sake, or malternatives, is simply not relevant to why the BA exists to represent its members interests. Finally of course, any trade group is just that. There will always be people who contribute to their industry who don’t want to join. There can be many reasons for this. Not all smaller brewers in Ontario belong to the Ontario Craft Brewers Association. The BA surely attempts to please a majority of its members, it is just common sense. But if any choose to leave the group because it appears Sam Adams is getting an undue break, that is their right. I suspect there will be very few. Craft beer from inception was about doing something different, evolving, taking chances. Its industry bodies must follow in synch but must recognize finally too the successes wrought by the industry it seeks to guide. A recent article by Simon Evans in the Financial Review incisively described a recent reverse for a venerable Australian brewer, Coopers Brewery Ltd. in Regency Park, Adelaide. Sales have dropped in all but its home state of South Australia, Victoria and Western Australia included. Long-time CEO Dr. Tim Cooper was quoted that the family-owned firm is caught in the crossfire of rapidly growing craft beer and aggressive marketing by the two major national brewers, Lion and CUB, both internationally-owned. Coopers has 5% of the national market, the two majors, 88% between them. The rest is down to the burgeoning craft market and a few imports. Tim Cooper has a plan to restore growth by boosting the company marketing expenditure; that together with new products, a Coopers Session and Coopers Dry, hopefully will turn things around. The company had enjoyed 24 straight years of growth, so the situation is not so dire when looked at historically; and after all ancestor Thomas Cooper set up brewing in Adelaide in 1862. The company has seen a lot of changes since then, including a period of share ownership by a major national brewer, but the family regained independence many years ago. Coopers stuck commendably to top-fermentation for a long time, only by about 1970 did it add a lager. True, the ales had evolved in a way to resemble lager to a degree, but still they were traditionalist in a country that had otherwise given up on its British brewing heritage in favour of European lager methods. I bought a six of Best Extra Stout, in production since the 1800s, in a sunny suburb rather distant from Coopers bailiwick, Boca Raton, FL. That Boca evokes an ethos rather familar to many Aussies adds an oddly satisfying note. The stout was packaged six months ago per label details but tastes fresh as a daisy, due in no small part to skillful bottling with a yeast addition. The stout is all-malt, unpasteurised, richly flavoured, in effect a taste of history. It is somewhat similar to the best versions of Guinness, but better IMO. Probably Guinness Extra Stout tasted like Coopers’ before the 1930s. Coopers benefitted from the post-1970s worldwide interest in quality brewing and was promoted enthusiastically by beer authority Michael Jackson. Exports to the U.S. and Britain followed. The brands acquired a loyal following Stateside which they still have in some areas. 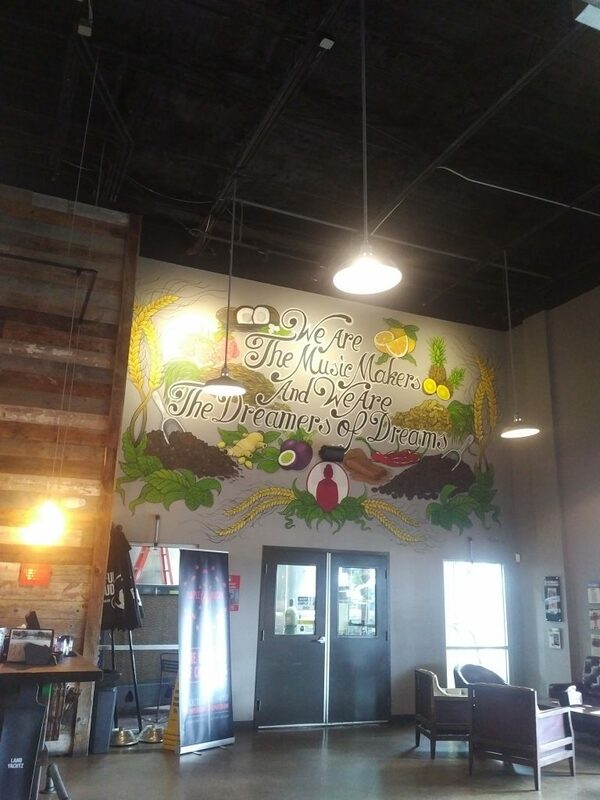 Coopers is one of the original models for craft brewing. Certainly its Extra Stout in any meaningful sense is a craft beer. It is far better than many stouts and porters of similar strength from craft breweries, frankly. There is no raw scorched grain notes, often associated with use of roasted barley vs. patent barley malt, no black licorice notes (viewed as a fault by at least one 1800s commentator), and no non-hops flavouring. Oh, the bourbon barrels are left to others, as well. The beer has a pleasant residual sweetness instead of the bone-dry quality of many craft stouts and porters, the latter imparted we believe under influence of the raw barley used in mashing Guinness. Many pre-craft, smaller breweries that influenced craft brewing transitioned well to the new environment. The symbiosis is entirely apt given their history, if indeed only due to their scale. Yuengling did it, Saratoga, Cold Spring, Fuller, Samuel Smith, Greene King, numerous Belgian breweries of course, and others. 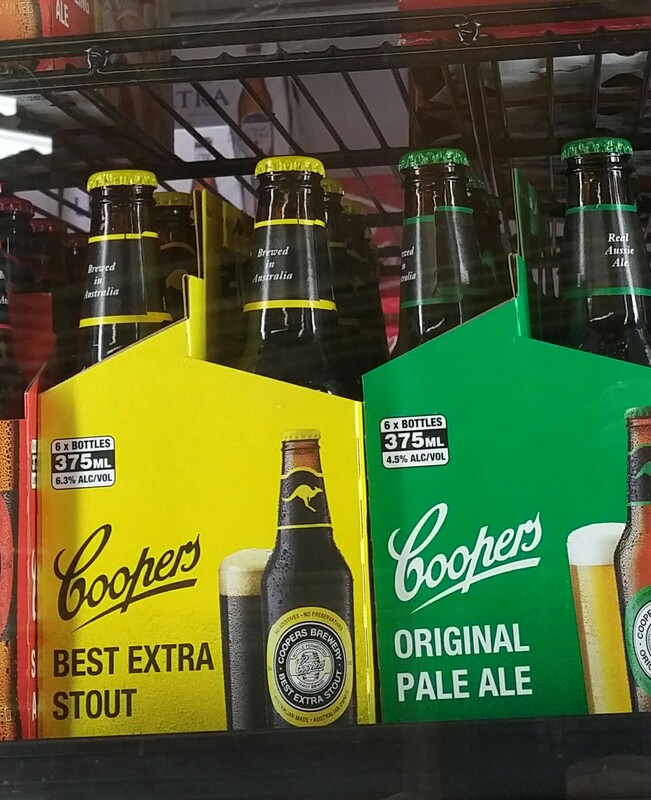 It seems Coopers has not positioned itself this way, yet it deserves the respect and purchasing dollar of the crafterati every bit as much as those. Need I add that Coopers has its own, now state-of-the-art maltings? That it has long supported home brewing with its widely popular homebrew kits and malt extract line? If all this does not spell an exemplary brewing heritage, tell me what does. Support the company, people. Yes, there are countless brews to choose from today but if Coopers loses its independence one day or even disappears from the market – perish the thought – much will have been lost. In Toronto where I am normally based, I would be happy to buy the beers but we do not get them at present. Even when we did, it was just the Sparkling Ale, certainly an excellent product when very fresh but one of numerous estimable products in the current line. We need to see a range of the beers, hark LCBO. With three and one-half years passed since this site revved up, but some 40 years before that intensive study of beer, brewing, and their history, my summing up tends to telescope a much longer period and experience than calendar 2018. Hence, we tend not to enumerate lists of favourite beers, pubs, beer blogs, and other writerly productions of the last year. Our perspective is much broader. As well, we have not the time to follow and read everyone who should be followed, and would leave out probably important names or information, which should not be slighted thereby. Further, for us the experience of enjoying a fine beer, or whisky, is much tied to the moment. A can of the same beer, bought at the same time, often seems different when broached a month later, whisky too even from the same bottle. So a nod may not hold much water, so to speak. It is better to give general impressions that take into account my long experience and how each year adds to it. In a word, 2018 has never been better. 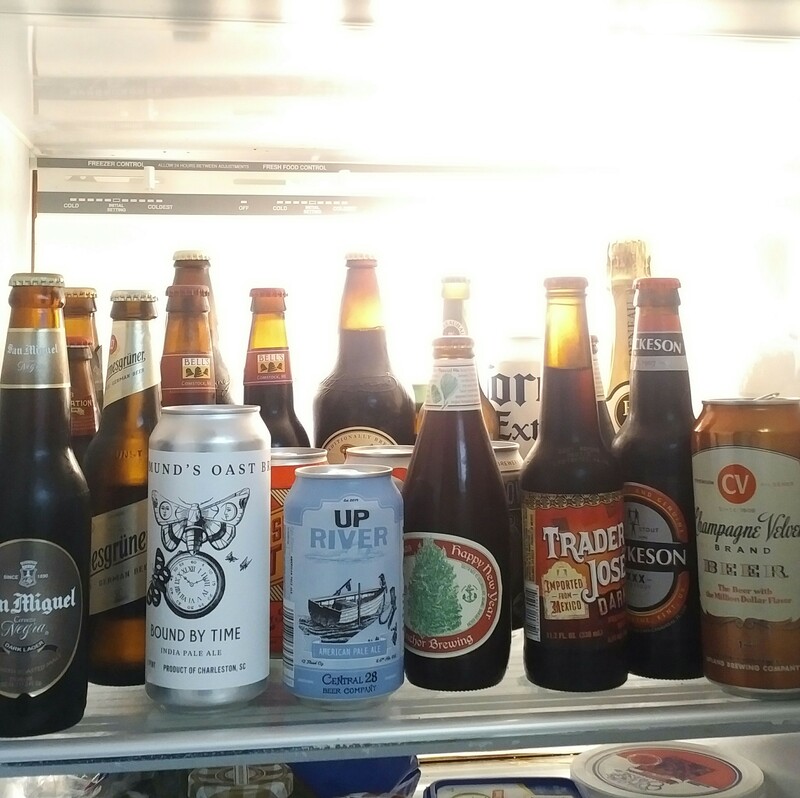 There is more choice of beer, and more better beer, than I have ever seen. Whisky and other spirits, the same. It is true in Ontario, and here in Florida where I am on extended sojourn. It is true in Britain and France, each of which I visited twice this year. It is true everywhere else I have been. At the same time, the wider beer world continues. Most people still like light, flavourless beer. In the supermarkets here the ranks of Bud Light, Michelob Ultra, Miller Lite, Corona, Modelo, and similar are long and impressive. The equivalent is true in Canada. In some regional markets, say southwest U.S. or south Florida, the Hispanic market remains a major demographic for similar beers from Central and South America. So this world goes on and likely will for a long time. So does the more traditional world of imports, where both quality and “price” pre-craft beers still sell well such as Heineken, Becks or other German brands, and many U.K. or Irish brands (Fuller, Newcastle Brown, and of course Guinness). We like some of these and have found off-beat brands from corners of Asia that continued traditional European styles often with more authenticity than Europe offers today. 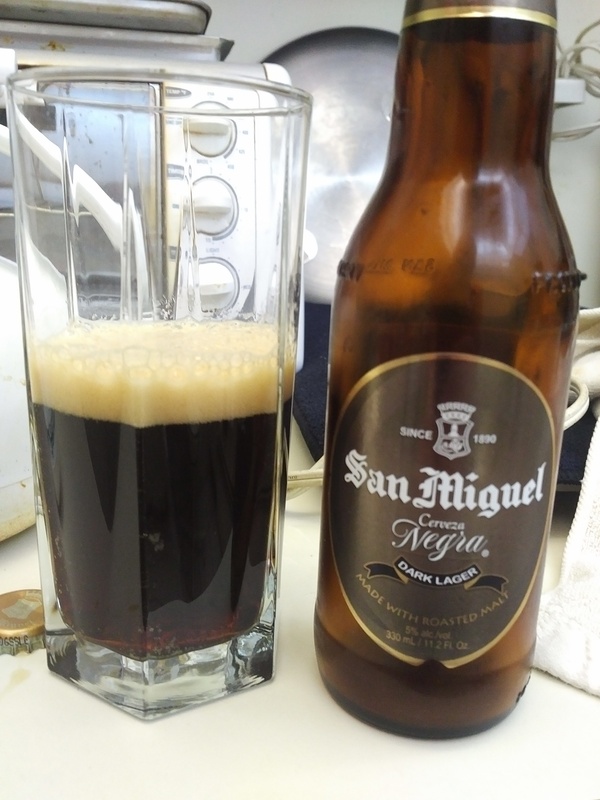 San Miguel Negra (Dark) from Philippines puts the Paulaner Dunkel I had in Munich in the shade, so to speak again. A beer from French-influenced Laos, 6.5% ABV Laobeer dark lager, was similarly superior in relation to dark lagers from France. Yet some German blonde lager, and other Dunkel or bock available here, show why Germany has been a byword for centuries for brewing. I mentioned some in recent tweets. These beers are rarely trumpeted in their home land in the way craft beer is here, but the relationship is close. If I had one granular comment to make for 2018, it is that this seemed the year in Ontario when almost every can of craft beer seemed to include wheat as an ingredient. Even in many ales and lagers this was true, in which it is not traditional. In Florida, the ale and lager equivalents I have run into wheat is not mentioned in the ingredient lists. I think the beers are better for it. Wheat seems often to add a drying or toasted note, especially in well-attenuated beers. It is simply not necessary in my view, and I wonder if it is being used to assist raising a head for beers that are over-attenuated. It is the one trend I have not liked but all the rest, from brut to brett, is fine with me even if I hew mostly still in personal supping to ale, porter, and lager. I should add as well that the limited edition 1870 AK Bitter, a historical recipe I brewed with Amsterdam Brewery in Toronto, was a personal highlight. We are repeating it in 2019 but the approach will be tweaked somewhat, details to appear here soon. The advent of online media has largely rendered books and magazines superfluous as a source of information for consumers, but they are still valuable for other purposes – historical work or memoir, say, or to showcase a skillful stylist, Briton Adrian Tierney-Jones is the foremost example. To use the vernacular that originated in the land I write, net net, it is all good. It is win win. And the reason for that is the freedom to implement new ideas in our liberal economies, to be a Ken Grossman in 1980, or Campaign for Real Ale seer in 1971, or Jim Brickman in Ontario in 1985. Risk there is a plenty – they go hand in hand – but innovation and creative thinking have changed the beer landscape irreversibly in 40 years. Change will continue depending on what producers (mainly, today) envisage, and what their consumers want. In a free society, so it should be. From a personal standpoint, where it began in 1978 and where it stands now is the realization of everything one could hope for and then some. Some years after I became familiar with the fundamentals of beer and spirits, I started experiments to blend bottles at home. Apart from it being intuitive to do so, it is a literal extension/modification of the mashbill common to both drinks, or of their hop component (or other flavouring), in the case of beer. And needless to say producers have been doing it forever, sometimes to achieve a particular flavour, sometimes for consistency. The idea to mix comes as mentioned from the mash which typically is a combination of malted and/or other grains. So by mixing finished whiskies, you are adding more elements, or more perhaps of the same type. One distiller might make a whiskey, say, from barley malt and corn. Another, from barley malt and rye. Mix both, you have a mashbill of barley malt, corn, and rye, which is a typical bourbon mashbill. Lot 40 Canadian whisky is 100% rye. If I mixed that with the Hudson bourbon that is 100% corn in varying percentages, I’ll arrive at near a typical bourbon mashbill, okay I’ll add a dash of Scots malt whisky to throw in the malted barley. Some consider that mashing and distilling these when combined vs. as separately produced results in a different taste. I just don’t agree with that after many years of experimenting. If I mix a Busch beer, which must be 50% grain adjunct today (it tastes like it) with a 100% malt beer I find too sweet, by simple calculations I can get the percentage of adjunct I want to dry down the palate, 50/50 produces 25% adjunct, which sounds about right, or I may aim for 15 or 20% adjunct. A lot of British and Belgian ale traditionally uses a percentage of maize or something functionally similar, perhaps sugar, or both. Finished beers and whiskeys of the same class, and even of different classes often, can produce an alternate taste you may like more than the constituents. At a minimum, it produces variety without increased expenditure. I do this all the time, it’s not rocket science but it’s surprising how many people are resistant to it. My favourite story, I’ve told it before, is I once ordered two 1/4 oz. samples of whisky at a LCBO tasting counter and combined them. A lady next to me was heard to state, “Is that legal?”. (Don’t say it’s a typical Ontario story, it can happen anywhere). The practice to marry or mingle created the Scotch blending industry and the Canadian whisky style, as well as cocktails. It lurks in the background to the development of porter, among other beers. Mingling occurs even with the same whisky type as the same whisky from different warehouses or parts of warehouses may taste different, hence batching them to get a more uniform taste. Every barrel can taste rather different in fact, even when all other variables are the same, even when the barrels sit near each other. Recently an excellent primer on marrying or mingling whiskey was given in Texas-based Wade Woodard’s whiskey blog, see www.tater-talk.com. I know Wade well, he is a devoted student of whiskey and long-time participant at the world’s premier bourbon (and related whiskeys) resource, www.straightbourbon.com. Wade established his blog, Tater-Talk, a while ago but I just learned of it. He was kind enough to mention me recently in connection with the home blending of bourbon, specifically in relation to the Weller brand, see here. I discussed my minglings frequently when active on the SB forums, and as Wade notes, some people called the practice Gillmanization. In his post Wade quotes at length an industry professional who makes some interesting statements about whiskey blending. Many things stated go back a long way in the industry. The idea for example to barrel up for a few months married whiskies is advised in this 1885 manual by Joseph Fleischman, down to using if possible an oak container to do the marrying, see pg. 28. Fleishman gives various blending formulas, with a progression of quality based on how much straight whiskey is used. If you use all-straight whiskeys, the highest quality, you are really vatting to use an old British and Irish term. The analogy with blending practice over the Atlantic is perfect. I don’t quite agree with everything the expert stated. For example, I’ve mingled whiskies that produce instantly a harmonious silky texture and taste, one doesn’t always need time to develop this. And conversely, some whisky blends remain disharmonious no matter how long you rest them. In general though I take the point that “time in a bottle” improves married or mingled whiskies. It’s the effect of some oxidation and other complex processes (see the post again). Wade has great knowledge too of the U.S. whiskey regulations and labelling practices, and offers many insights in his writing. If you like reading about whisky, don’t miss his regular postings. Obs. It won’t surprise anyone reading that logically, one ends by mixing beer and whisky. And of course some people do, in beer cocktails, and via, too, the frequent practice of bourbon barrel aging of stout and other beer. Hopped whisky is the other side of the coin, as is whisky finished in a barrel that held beer. Even wines come in for the treatment now – and vice versa. It’s a bibulous fusion, we see it in cooking – what else is a recipe but a blend – but also in combining elements from different national cuisines, and in contexts outside food and drink, music, say, that may influence how people prepare food and drink, perhaps even subconsciously. 40 years ago, emboldened by some freshly-printed consumer beer texts (by M. Jackson, M. Weiner, J. Roberston, etc. ), I’d seek out the local beer scene on travels. I also tried the imports, a suprisingly large range if you had a good retailer source, and regional or national brands. So my beer education is of long standing and predates in fact the craft beer era. For this reason probably, I retain a fondness for that era, as some of the beers were good and with the benefit of looking back, interesting at a minimum. In 1973, a brewer called Duncan from the northeast set up a brewery between Tampa and Orlando called Duncan Brewing Inc. His focus was price beers, making beers both under his own name and for private labels. “Dunk’s”, quite naturally, was the house brand but there were others. Establishing a new, independent brewery then was highly unusual. Still, it happened here and there, e.g., in Alaska in the mid-70s in the form of Prinz Brau, owned by the Dr. Oetker group in Germany. (Yes, of the pizzas you know and love). It happened in Ontario in ’73 in Hamilton when Henninger of Frankfurt set up brewing there albeit on a brewing site founded by Andrew Peller in the 1940s. And it happened here in Florida. Who was Mr. Duncan? His full name was Lemoyne Nathan Duncan, originally from Maryland. He lived from 1917 until 2010. You can glean details of his life in this memorial notice. He sold out to the conglomerate Heileman in 1980 according to Jim Roberston’s The Connoisseur’s Guide to Beer (1982 edition). He may have continued working in the brewery as the notice states he retired at 69. One wonders what he thought of the craft revival, something he did not capitalise on; it was just too early and Florida then was not the most propitious place for it. In the 80s the brewery was sold again and at least once after, to independents. Today it’s owned by the Venezuelan beverage and food group that make Polar Pilsner, a big seller not just in Venezuela but elsewhere in South America, in Central America, and into south Florida. Florida Brewery in Auburndale today hence makes Polar Pilsner, its main brand. The brewery also makes a line of malt beverage (non-alcohol), popular in Hispanic markets. It seemed long odds arriving in Florida again in 2018 that Lemoyne Duncan’s brewery still exists, but it does. Polar Pilsener is in the older, refreshing, pre-craft style. I won’t judge it until I taste, but online reports use terms such as the Budweiser of South America. In an odd kind of way, perhaps its profile ends by being similar to the Dunk’s of the 1970s, to which Jim Robertson gave a respectful review. Maybe I’ll even get up to Auburndale. Florida Brewery has a beer garden, I understand, and may make craft-style beers for sale onsite. Get out the GPS. Postscript: Florida Beer Co. Ltd., which I mentioned earlier, is a different concern, based in Cape Canaveral. It too though is owned by a large group further south, in its case based in Trinidad. Hence Mackeson stout being made in Florida now. Today is auspicious: the 77th anniversary of the Pearl Harbor attack. We offer our remembrances, with the thought that while time’s flight makes such events seem remote, they must always be remembered for the lessons they offer for future tests of freedom. Can You Show me Where you Are? Ben Morgan in the comments here recently made some interesting points about a visit to Watou in Belgium and the new restaurant and centre at St. Bernardus there. St. Bernardus overcame the loss of monastic approbation and continues the old recipes, while those of Sint Sixtus have evolved. The two breweries, in this and other respects, have a modus vivendi. It is a good example of the special character brewing has in business. The religious element probably favours it in this case, but still. The worldwide popularity of Belgain beers occurred in the last 40 years for quite specific reasons I’ve discussed earlier and won’t rehearse. That trend built on and expanded the special position beer has held for centuries in Flanders and Wallonia. Beer was part of gastronomy in Europe, in these regions and a few others, long before the world caught on via inquisitive journalists and clever publicists. The social history of beer in Belgium and northern France remains to be written, vs. many aspects of its technical and business history. But there is no doubt beer enjoyed a special respect in Belgium that endured even under unfavourable circumstances. Nothing similar had existed in North America or Britain, certainly. grunt—or tab—bore more than a slight resemblance to the national debt, it was wonderful again to taste roast beef and ice cream with thick chocolate sauce. Sadly the writer, Henry W. Clune, was a self-professed non-beer drinker, so we get no direct assessment of 1940s Trappist beer, but his report is clearly based on informed opinion. Think about it: only three years before, a cruel German occupation meant, if not great physical damage as the article notes, privation for most and death or jail for not a few. Just 36 months later, a rich culinary and catering tradition is restored. It was probably more or less the same in Paris, but Britain still struggled under food rationing. It seems the occupied nations were in some ways better off than the victors, not America of course but it was much further away from the fighting except as noted in Hawaii. This recognition of Belgium’s own appreciation for Trappist beer, something that evidently predated WW II, is one of the first international acknowledgements I know of for the genre. A second followed in the 1969 article by Phillipe Mercier I discussed in this post, which showed that Trappist breweries were using all-malt in 1969. But Mercier was writing in an obscure scientific journal vs. Clune’s general audience. The Belgians simply have a special relationship with beer, and food. Even though they took to mass-produced lager like everyone else, cranky artisan styles survived there long enough to help found an international brewing revolution. In turn that helped ensure the health of abbey and other specialist brewing in Belgium, whence the vibrancy of St. Bernardus today. Maybe if Clune had liked beer and praised this rare specialty of Trappist beer in 1948 it would have spiked interest in the U.S. much earlier than the mid-70s. Some Trappist beer was available in the U.S. before Michael Jackson’s 1977 The World Guide to Beer, but it was just another oddball import. And some reviewers dismissed it, and other idiosyncratic Belgian ales, as an obscure byway not likely to interest their readers. I discussed some of this commentary in my recent article in Brewery History on 1970s, pre-Michael Jackson American beer writers. Every country, at least in pre-globalized times, had its interests, its priorities, its special gifts. It wasn’t even a question of one category trumping the same in another. British beer arguably in 1950 was as diverse and interesting as Belgian beer, more so in some ways. But the British, and North Americans in their considerable wake, at least until the consumer revolution of the 1960s, were interested mostly in other manifestations of culture: cars, music, film, fashion, sports. Germany, despite its reputed obsession with beer, was not much different by the postwar era. Can one imagine a foreign journalist being told in New York in 1948 that the “in” beer was Ballantine India Pale Ale? Or in London, Colne Spring Ale? No way José. Don’t be barmy. You want a good beer do you? Here, try Miller High Life, it’s much better than the stuff the pokey Brooklyn breweries still foist on us. Have a go with this Barclay’s lager, it’s brilliant, the future for beer in this country. Times did change, finally, both Stateside and Blighty for wine, beer and the eating arts. And they play rock and pop in Belgium now, the chansonniers had to give way, hélas. Posctscript: Henry Clune died in 1995 at an impressive 105, long enough to see the beer revolution take root in America. He lived near Rochester, NY, not all that far from Ommegang in Cooperstown, the Belgian-inspired brewery that made its own contribution to the beer revival. The Trappist beer Clune didn’t taste but took note of in 1948 wrought a change in American customs he could hardly have imagined then. * See Ben Rogers’ correction on this point in the Comments, the fathers at Westvleteren had never ceased brewing. Most of November was devoted to a major essay I posted on butter tarts history. I’m working with the editor of a food journal to have a referenced, expanded version in print early in 2019. Currently I’m spending some extended time in south Florida. The car-dominant culture always makes an impression in the U.S. The whole way of living is built on it, certainly in endemic suburbia, in Canada too of course but nowhere is it more apparent than the south and southwest. Prolonged heat and a paucity of public transport make vehicles a necessity. I’m not the first to say it, but it’s salutary to remind: the car and air-conditioning worked a social revolution here. Almost no one walks except to and from the car. Jack Kerouac once said Americans have a characteristic lope from the way of walking on parking lots; it’s true. Yesterday I did a two-hour jaunt through residential and light commercial Fort Lauderdale and didn’t pass another walker, not one. The only people I encountered were leaving or approaching vehicles. One or two were on bikes, but nothing to what you see in the urbanised north. Parts of Miami Beach and Miami are different, but the suburban pattern is widespread here. Of course the areas are very attractive. It’s a way of life that, while earning the indifference or derision of some, is the envy of the world and has been emulated from Britain to Brisbane. Even in my folk music phase in the 60s, shortlived as it was, I never bought into the jazz of “little boxes on the hillside, made of ticky-tacky”. My own family history disproved the proposition only too graphically. Then too there is romantic truth, or exaggerating to make a point, and real truth. I’ve purchased beer for four days straight here including in Total Wines, Trader Joe’s, Aldi, and ABC Wines and tasted pehaps a half-dozen. I buy based on criteria important to me but probably opaque to many. Sometimes it’s 1970s classics such as the discovery of the trip so far, San Miguel Dark (Negra on the label), from Phillipines. People say you can’t remember taste from 20 years ago, the only previous time I had it. It’s not true, it tastes exactly as I remember it, I think in Philadelphia. It’s no wonder a panel picked it as the top beer in a 1970s Business Week poll as mentioned by beer bard Michael Jackson. I also buy for value, as it’s easy to find, say, of the 2,500 beers at Total Wines, something in the category you want at half the price of another. Take Bell’s Christmas Ale, a Scotch Ale going for just a couple of dollars; you can spend much more for similar beers. Ditto Anchor Brewing’s spiced Christmas beer also just out. For 50 cents off you could buy Anchor’s 2017 edition, so I’ll have both to compare. A six pack at Aldi of Wernesgruner, just eight weeks from packaging, tasted super-fresh and went for a song. A buck a beer, you know. It had more grateful bitterness, in the finish, thank you, than most craft lagers I try day in day out. But I will “spend” when I want to, I’ve long wanted to try the rum barrel version of Chimay Blue, the famous Trappist beer, so $25.00 later it’s in the bag. I’ll crack it with Dave Lee in Toronto when I get back in January. And I bought a few craft beers in the higher price range just because I wanted to. Brewers are entitled to charge what they feel a beer is worth, and when I encounter a fine experience I am never sorry. 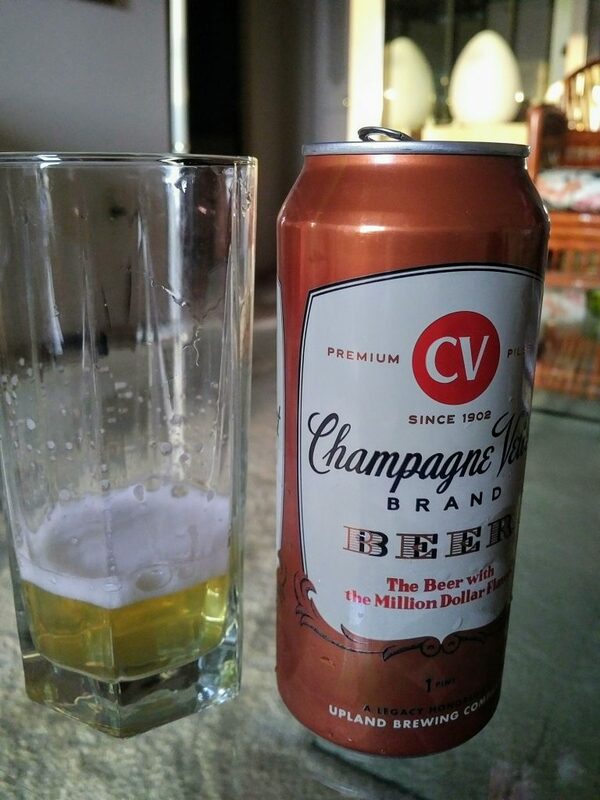 A Champagne Velvet lager from Upland Brewing in Indiana really impressed. An online review states it’s like Coors Light if made by a craft brewer which is kind of true, but the different slant makes all the difference. All the flavour in the grains is preserved by the brewing attenuations of the 1930s and earlier, which I discussed in previous posts here. 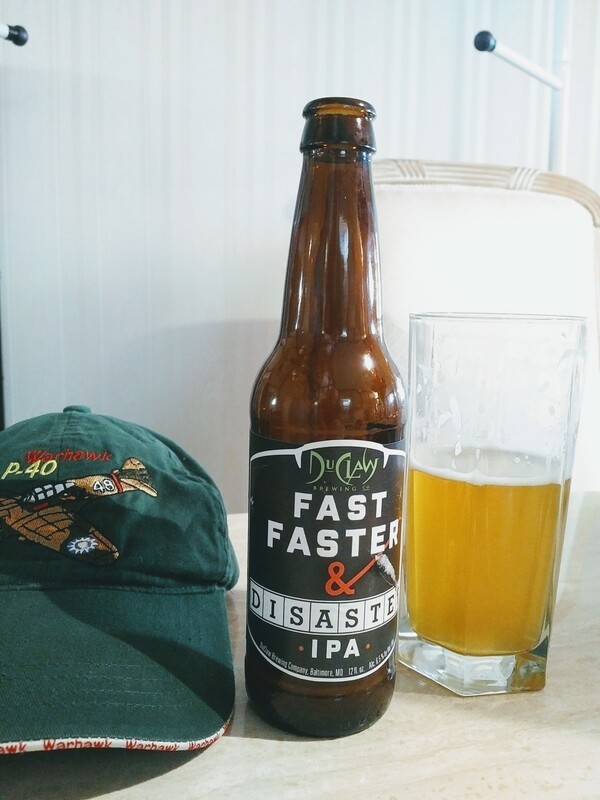 A Baltimore IPA was really good too, Fast Faster and Disaster with every element in the cone. Cone, not zone. Fighter aircraft enthusiasts will get the reference from the Curtis-Wright P-40 on the hatgear. I check out Budweiser too when in the States. The one I tried yesterday was terrible, the malt adjunct taste was unpleasant, and apart from that it tasted virtually like soda water. The beer was much better in the 1970s as I well remember and beer writers of the time chronicled. What a comedown. A beer with a great history and heritage left to languish. 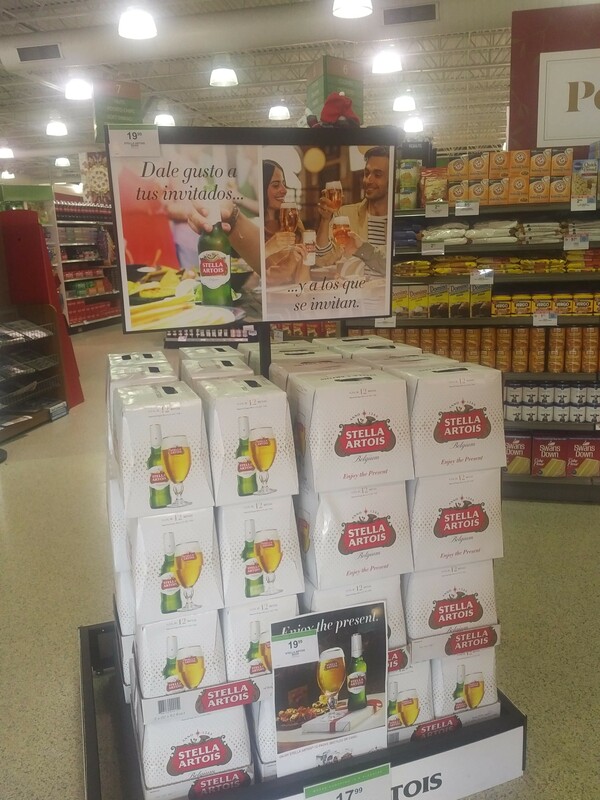 The owner clearly focuses now on Stella Artois for the premium segment. Stella was better too decades ago, imo, but is still a decent quaff when fresh. Finally, Guinness Extra Stout as currently imported from Dublin is a standout: rich, malty, bitter, everything a good porter should be. Many craft versions of stout and porter at around 5% abv fall quite short, but then taste is personal. We speak for our taste, here. I’m meeting up with friend Gary Hodder at New Year’s in Naples and we’ll taste much of what I bought then. And if we run out I know where to get more, courtesy the amazing Total Wines. Obs. The Mackeson stout is brewed in Florida by a long-established craft brewer, Florida Beer Co. in Cape Canaveral. Florida Beer was bought by the owners of Carib Brewery in Trinidad and Tobago a couple of years ago, and Carib has long brewed Mackeson under license. Hence the devolution to Florida Beer for the U.S. market. Ontario’s supply of Mackeson is still from Carib.